For many years, Mersey Morris Men have had a ‘semi-tame’ Liver Bird as their team mascot. Or rather they have had a succession of Liver Birds as nature and Old Father Time have taken their course. The Mersey Morris Men’s Liver Bird appeared regularly with the dancers at special and important events, often putting in an appearance in Willaston on Boxing Day. The Bird even accompanied the Mersey Morris Men on some of their overseas tours, although EU Veterinary Regulations are now proving increasingly problematic. 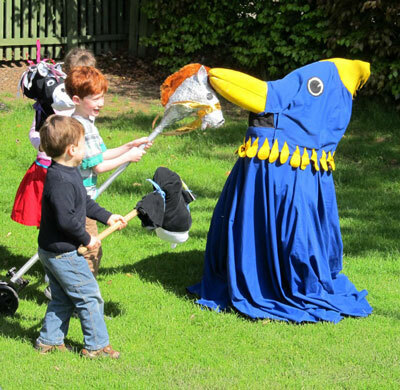 From time to time, the chosen Liver Bird has brought along a younger member of its family to an event. 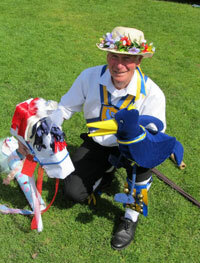 Long-standing followers of Mersey Morris will recall that for many years, one Bird was almost inseparable from its egg, which developed a personality of its own. More recently, a small orphaned Liver Bird has been putting in an appearance, sometimes by itself, sometimes with the team’s Bird, but always accompanied by Arthur, the Mersey dancer that had adopted it. However the Mersey Morris Men recognised the increasingly elderly status of their current Bird was beginning to affect its willingness to appear in public. And some ill-advised remarks about its weight were probably not helpful either. And so a project was launched that the team hoped would ultimately result in the next generation of Liver Bird to appear in their performances. With guidance from a local vet and other specialists, a careful breeding program was put in place to produce the ideal Liver Bird to appear alongside the Mersey Morris Men. And they believe it was successful!!! After the normal period of hatching, fledging and maturing, Mersey Morris Men now have a Liver Bird with striking, almost iridescent plumage. And because it has grown up alongside morris men, it appears at ease with the dancers, the music and the audience. It should be pointed out that this is in marked contrast to some of the previous generations of Birds which have been decidedly irritable, some might say almost evil!! As a result, Mersey Morris Men are hoping that their new Bird will be seen out around the Wirral a lot more regularly, and hopefully further afield as its strength and confidence grows. 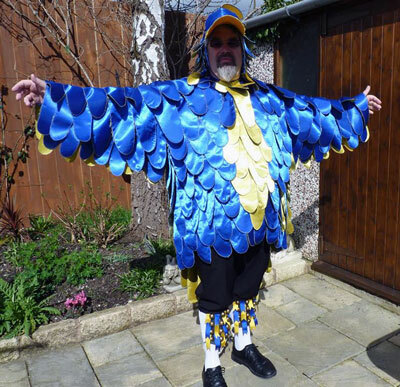 So whenever you see Mersey Morris Men, the ‘new’ Liver Bird is probably not far away…. Now, he just needs a name!!! This entry was posted in news by Squire. Bookmark the permalink.